The Peter Pan Collar is a basic, rounded collar that sits flat against the neckline of a blouse. It is a classic style. This simple neckline is very easy to draft, easy to sew, and can be as large or as small as you’d like it to be. 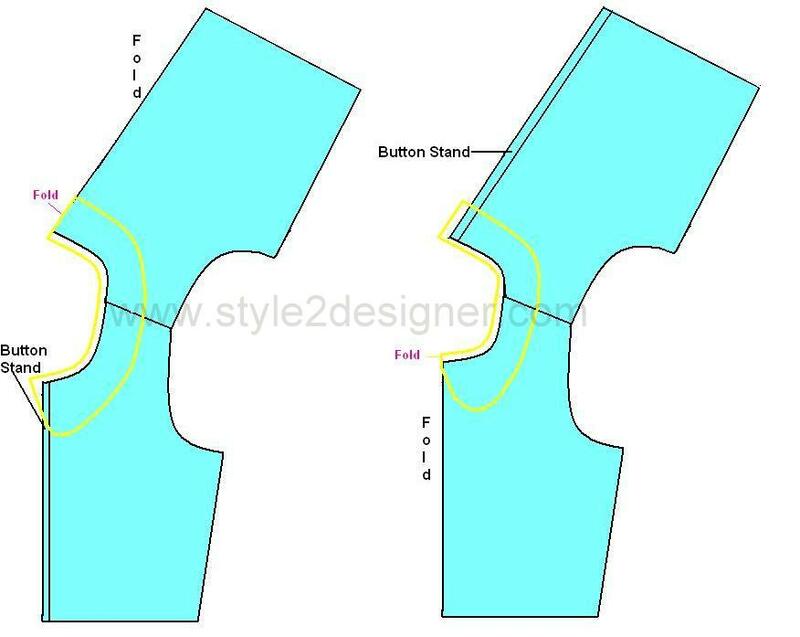 While the rounded front is the traditional look, you could also do a square, pointed shape at the front of the collar. Unlike a shirt collar, this style will not stand up against the neck, so even a square front version will still be a Peter Pan. Use the collar on a stiff white cotton blouse, or use a satin collar to a crepe blouse with fancy or satin covered buttons. 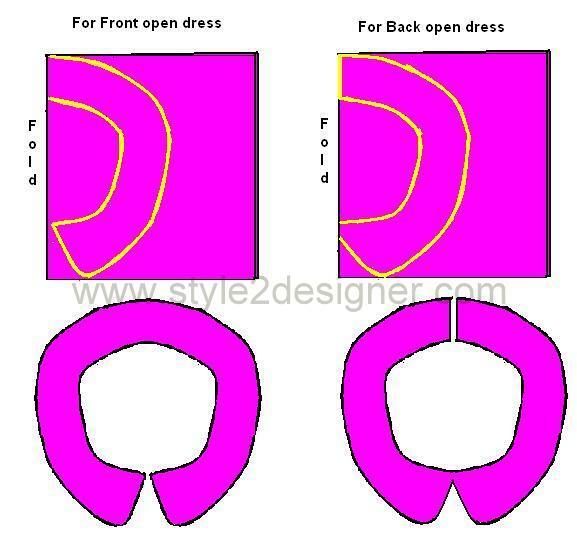 I hope you are going to learn from this tutorial a fashionable Peter Pan Collar for dress and Accessory. 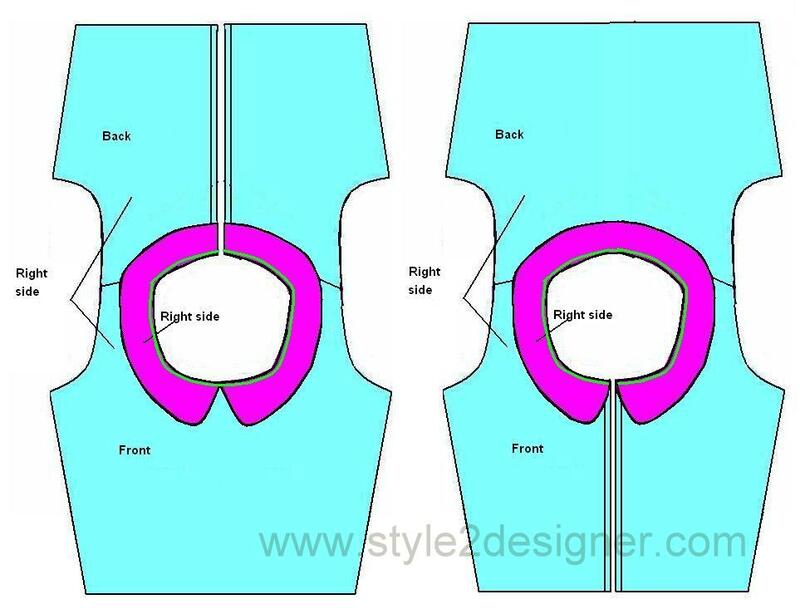 I have decided to give you draft for Dress with front opening and back opening. Here I attach images with two drafts. Use whatever you want. This collar is very easy to draft. Simply follow the curve of the neckline (collar width as per your wish. This collar may be any width you choose; it can be very small and elegant) and add a curve at the center front. Add 1cm all around the collar area except at fold. Mark with fabric marker or chalk. A basic Peter Pan is about 2″ wide. Swing the curve up to the neckline when you come close to the center front,. This creates your front collar shape. On the back, you will again follow the shape of the neckline, from shoulder to shoulder. 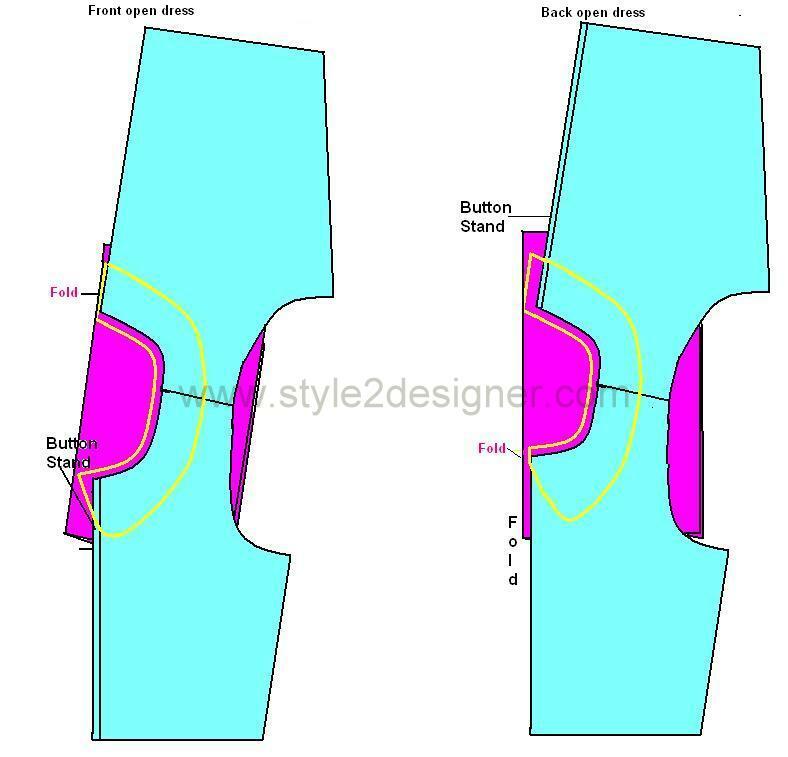 Cut the collar piece from folded cloth by follow the yellow line mentioned in the above image (Cutting on folded area makes the collar front curve look constant at both sides). If you use medium or heavy weight fabric for collar you should cut 2pieces, but you work with light weight fabric you must cut 2 fabric pieces and 1 interfacing cloth or waxed canvas for stiffness. For medium or heavy weight fabric just place 2 collar pieces by facing wrong sides together and sew along the curved bottom edge, using a 1/4 inch seam allowance. Clip the curves and then trim the seam allowance. For light weight fabric first press the canvas on wrong side of one collar piece and place with other collar piece by facing right sides together, then sew along the curved bottom edge, using a 1/4 inch seam allowance. Clip the curves and then trim the seam allowance. Turn the collar pieces right-side-out and iron. Turn your dress inside-out (before that ensure your dress front or back open area should finished) and mark the front or back center and pin the collar pieces to the neck line of dress. 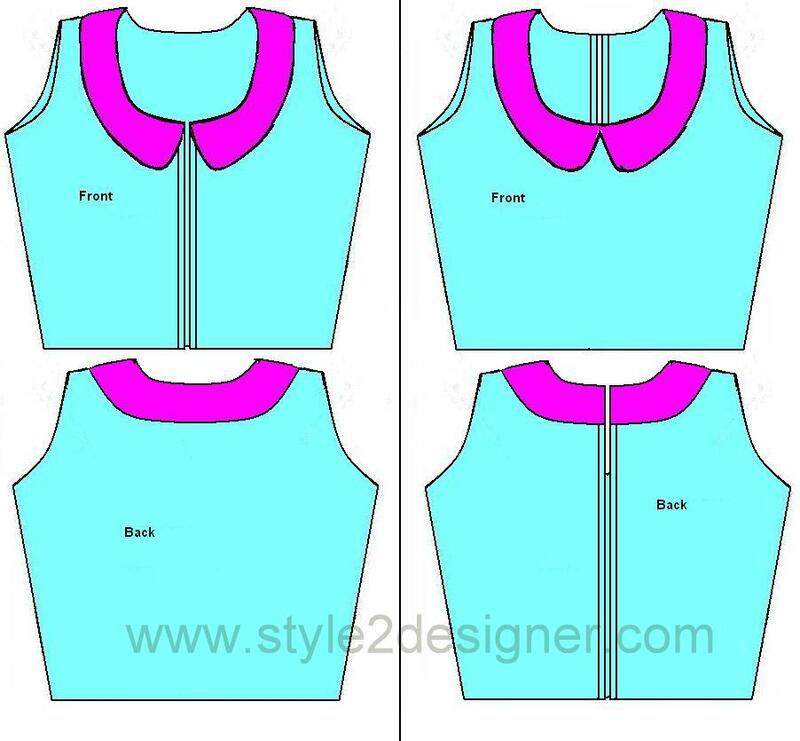 Sew along the collar with neckline to fix. Turn the dress right-side out, fold the collar over to the outside, and press with iron. 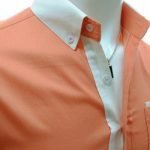 Usually it looks good with out basting; if you want to fix the collar more than that you may give a top stitch on collar neckline. You can make this Peter Pan Collar as removable one with simple variation and adding up some sequins.